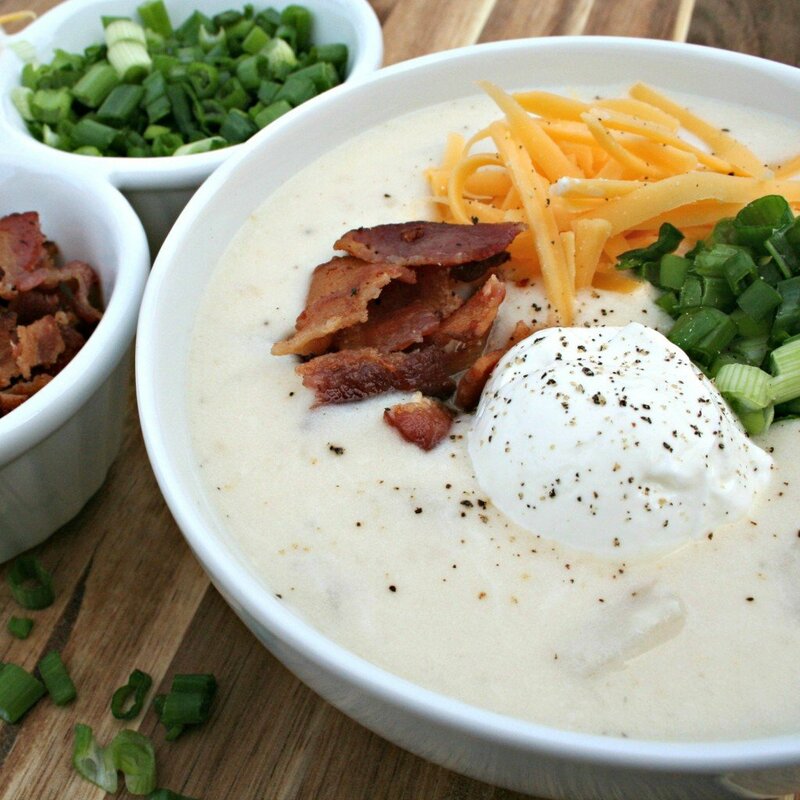 Slow Cooker Baked Potato Soup is one of the best soups to make in the slow cooker! Baked Potato Soup is my all time favorite, I order it at every restaurant when it is available. You can’t beat how creamy this soup is, and how great the toppings blend in. You will see in this recipe I am not actually baking the potatoes, just peeling and dicing raw potatoes. 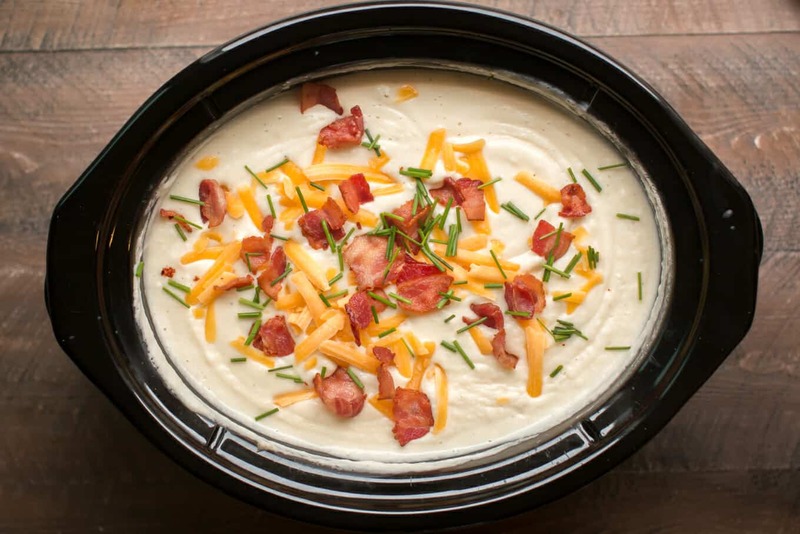 I’ve made baked potato soup before with leftover baked potatoes and it can tend to be gluey. 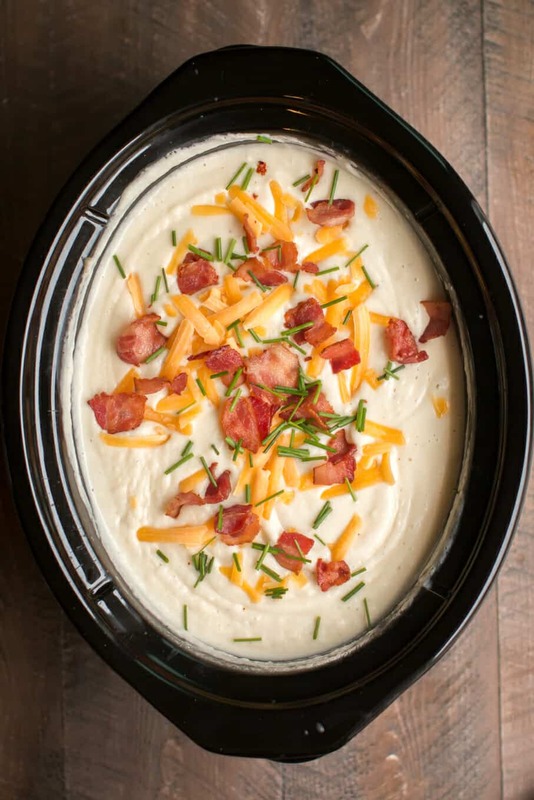 This recipe for Slow Cooker Baked Potato Soup, has a bit of prep work, but it is really worth the time. You can peel and dice your potatoes the night before, just place them in water, and refrigerate. Drain off the water before starting the recipe. You can top your soup with any toppings you please. My family’s favorite toppings are the standard loaded baked potato toppings, cheese, sour cream, green onions and crumbled bacon. 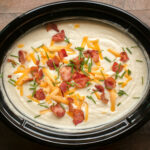 Below is my YouTube video of how to make this Slow Cooker Baked Potato Soup Recipe. You can follow me on YouTube, here. This recipe makes a ton of soup! Great recipe for having leftovers or great to serve company. Peel, and dice your potatoes in a small dice. Add potatoes, garlic, onion, black pepper and chicken broth to slow cooker. You are now going to blend about 2/3's of the soup with the cream cheese in your blender, you may need to do this in batches. Nutritional Values are approximate. The toppings are not included in this calculation. your recipe for potato soup was the bestest….tried it last night ….and i am about to burst…just to good to put the spoon down….thanks for shareing…..I LOVED IT!!!! I’m making this soup today, it sounds amazing. Is it possible to substitute plain/greek yogurt for the cream cheese? If so, would the measurements be the same? While I do like cream cheese on my bagels and in cheesecakes, I’m not a huge fan of it elsewhere – also the yogurt would be a healthier alternative… so I was just curious! Angie, the Greek yogurt may work good. It would make for a little runnier soup, but would be healthier! I leave for work at 7 in the morning and am looking for recipes that I can let cook from 7 in the morning until about 6 or 7 at night. Is there any way to make this recipe in a way where it has to cook for longer? Is there anyone home at the 8-10 hour mark? if they could set it to warm until you get home? if not, you could try cooking for 11-12 hours, the potatoes will be pretty tender, but if you top the soup with crispy bacon it would be good! Try using a standard light timer to delay the start time. Set up the crockpot then set the timer to power it up a few hours later. Some newer models have this a programmable feature. Only use this for short delays <3 hours. Not recommended for recipes with meat or other high perishable ingredients. Im making this soup this weekend. My question is, can i freeze the leftovers? Not understanding the cream cheese mixture. Do you blend and add after the soup is done and/or do you have to cook it a bit longer after you add the cream cheese mixture? when the soup is done and we blend the cheese in do we blend the garlic with it. So it says to leave the garlic cloves whole. I’m afraid that someone will get a whole clove of garlic at the end. Please explain. You can place them on top, and make sure to fish them out and blend at the end. I made this soup today and we loved it! So creamy and hearty. I prepped everything last night and just threw it all in this morning and tada! 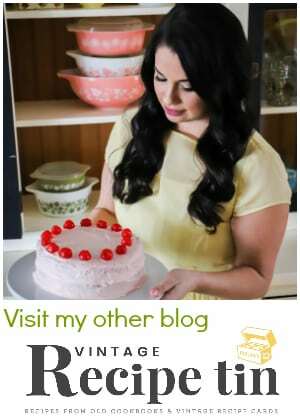 I used an emerson blender to blend the cream cheese and it was super easy. Just wondering if you have tried using pre-shredded hash browns and wondering if that would work OK. It’s what I have on hand…..thanks! Those may work ok. I have seen a Paula Deen Potato Soup recipe that uses the cubed frozen potatoes, and everyone raves about it. This looks amazing! 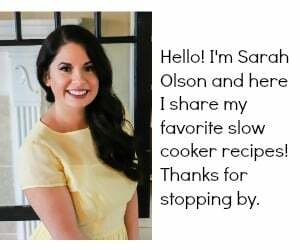 Can it be done in a 4qt crock pot? This potato soup sounds amazing! I am looking for new ways to incorporate more kale into my diet. Could I add fresh kale to this recipe? If so, at what point during the cooking process would you reccomend adding it? Here are my 2 ideas. Add the kale during the last 1.5 hours, and scoop around it to get the liquid and potatoes out to blend up the cream cheese with (after the cooking time is up). OR boil kale separate for about 3-4 minutes on the stove top. I can’t wait to try this recipe today. Use an immersion blender & you don’t have to remove it from the crockpot to blend! Great tip! I need to get one of those! This looks so good! 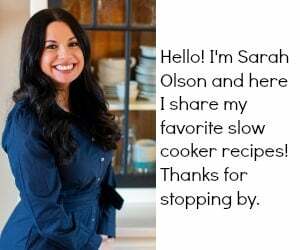 I have a 5 quart slow cooker. Would it be big enough to hold everything? I think it would over flow after adding the cream cheese. This recipe makes a lot of soup. Is there one potato better suited for this soup? Is there an alternative for using cream cheese? (i.e. heavy cream, etc)? I’m looking to do freezer meals for the arrival of my first baby. Would this one be able to be frozen after cooked and reheat well? Hi Stephanie. Great question. Potatoes don’t do well in the freezer, they get really mealy. 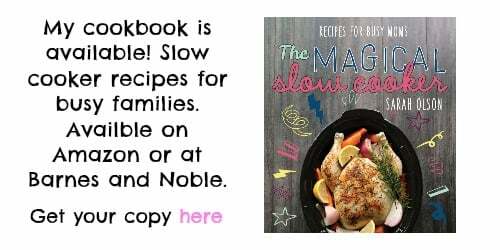 I’ve tried it with this recipe, and it was not good! We have several rainy days in the forecast. I’m going to put this in the CP for one of those days. But my family doesn’t care much for cream cheese. I think I’m going to try it with Velveeta, instead. It has kind of the same consistency. Hoping it works! This is THE best potato soup I’ve eaten. Made it without any changes to the original recipe. I will be making this often Thank you! Can this be cooked more quickly if put on high? I keep forgetting to start this earlier and we are going to be eating pretty late! Yes! I should do fine on High. Probably 6 hours. Do you know how well this work being heated up for a second day? It does very well. I do it on the stove top over medium heat. I hope that helps! We are having a chili/soup cookoff at work and this sounds amazing! Do you think If I started it going the night before around 10 and then mixed in the cream cheese around 6 in the morning then brought it to work and let it just let it sit on warm or low it would be fine until 11-2? This may have been asked but is it possible to cook it on high for 4 hours instead of low for 8 hours? I think this would work Wendy. I’ve never tried this, but I would think 4 hours on high, if the lid wasn’t opened would cook the potatoes. What’s a good substitute for the chicken broth? Looking to make this vegetarian friendly. I usually sub vegetable stock but wonder how that will affect the flavor in the end. This recipe was amazing, I was worried since I’m not a huge cream cheese fan- I used 95% fat free cream cheese and it was filling which was great but no weird cream cheese taste, just the promised delightful baked potato flavour and texture. It also lasted really well the next day for lunch and more leftovers a couple nights later which surprised me. I still have some in the freezer, i’m hoping might be ok when thawed out to but it’s pretty much the perfect recipe! Can you add cheddar cheese to the potato soup, in addition to the cream cheese? Can half and half be used instead of cream cheese? If so, how much? Will the soup be thinner with half and half? Yes it will be thinner, you can more potatoes and blend up a bit more at the end to get more thickness. When would I add the cheddar cheese? During the six hour cook time? I would at the end after the cream cheese. So many soups call for low sodium chicken broth so as not to be too salty. Would this soup taste better with low sodium broth or regular? So anxious to try it! Hi Sandy! If you are concerned I would do low sodium, then you can add a touch of salt at the end if needed. Hi Sarah, Can I cook this on high for six hours rather than low at 8-10 hrs? Can I add oysters in a jar when I put in the potatoes, etc? I would stir them in towards the end. After it’s been blended together.